A major new tourist development in Northumberland is recommended for approval again next week, but the parish council and local residents are calling for a further delay. Plans for a large holiday park on the former Steadsburn opencast mine site, between Widdrington and West Chevington, was on the agenda for the county council’s strategic planning committee meeting at the start of the month. However, the day before the meeting, the application was withdrawn amid concerns the community had not had a fair chance to have its say. And objections have now started to flood in after an error in the consultation process. At the meeting, Liz Sinnamon, from the council’s planning department, explained that it had come to light after the agenda had been drawn up that the application had been listed in the wrong parish. While the correct parish council – Widdrington Village Parish Council – had been consulted during the process, the application remained in the wrong parish on the authority’s online planning portal. Ms Sinnamon said that the reconsultation should only delay the decision by a month and so the scheme is now due to be decided at the December meeting, which takes place next Tuesday (December 4) afternoon. The proposals had not attracted any objections before, but now around 30 residents have lodged their concerns. The parish council, whose previous response was that it supports the development in principle, but with a number of reservations/concerns, has now called for the developer and the county council to ‘undertake proper and meaningful consultation’ with the parish council and residents. 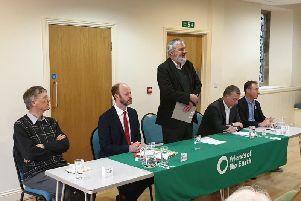 This followed a parish meeting, which ‘was attended by a substantial number of residents who were very upset and angry at the lack of information available to them with the respect to the development’. The parish council believes a deferral is ‘the only correct course of action’, but its response for now is that it objects to the application on a number of grounds. Councillors are being asked to make a decision on a hybrid application by Callaly Leisure Ltd for what it is calling Chevington Castle Holiday Park, seeking full planning permission for the scheme’s first phase and outline approval for the second stage. Phase one is for the creation of a holiday park with up to 275 static caravan pitches, 200 all-weather pitches for tourers/tents, a two-storey main building, a toilet/shower block, a workshop building, 475 parking spaces, outdoor play provision including a play area and lakeside beach, water-based leisure activities plus roads, footpaths and landscaping. The main building would include a swimming pool, sauna, indoor play space, catering facilities, reception/office accommodation, beauty treatments floorspace, a laundry area and a small shop. The phase two works would comprise a further 475 bases for holiday homes and a nine-hole golf course with a lakeside café, all in a woodland setting. The report to councillors explains that it is envisaged that the proposed development would generate 100 full-time and 30 part-time jobs, while the various leisure facilities would be open to non-residents too.